Created for Healthcare professionals, this website is designed specifically to inform healthcare professionals of the use of Botox for migraines, as well as recommended dosages and limitations. BOTOX® for injection is indicated for the prophylaxis of headaches in adult patients with chronic migraine (≥ 15 days per month with headache lasting 4 hours a day or longer). 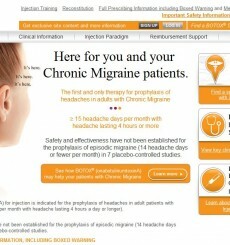 It is THE FIRST AND ONLY therapy for prophylaxis of headaches in adults with Chronic Migraines. Visit the site by clicking here.